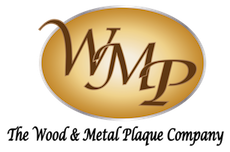 Welcome to the memorial and commemorative plaque page of the website of The Wood & Metal Plaque Company, a division of Art Sign Works, Inc. that specializes in designing and manufacturing custom plaques. This page provides a description and photo Gallery of our custom and personalized wall and podium plaques which honor and memorialize those no longer with us. We offer the highest quality materials and workmanship, great customer service, short turnaround times (typically 30 days from order to shipment), and factory-direct affordable prices. We also offer wholesale prices to retailers and re-sellers, and discounts for buys of 3 or more identical plaques. All our plaques are manufactured in the USA. On this page we show a photo Gallery and descriptions of our custom, and personalized carved metal-plated, and cast bronze and aluminum memorial plaques. We also make plaques with giclee photos and dimensional carved wood and artist-painted High-Density-Urethane (HDU) memorial and commemorative plaques, for both outside and inside locations. ,We have many styles and materials, and can make plaques in sizes from 10 inches to 60 inches wide. We have made hundreds of these type of plaques, a few which are shown on this page. In this photo gallery we display indoor wall plaques for the home and for families. These plaques can be ordered in any size from 12 inches in diameter to 4 feet in diameter, depending on complexity. We make wood (Mahogany, Cedar, Walnut, Maple, Oak), artist-painted High-Density-Urethane (HDU), and metal-plated (bronze,brass, copper, German silver, aluminum) wall plaques as shown throughout this and other photo galleries on this website. We can customize the size, shape, carving relief, text, materials, and color scheme of any plaque shown on this page, and we can make a custom plaque for ANY artwork you may have. Send us a drawing, a photo, or a rough sketch, and we will design and make a carved dimensional plaque to your specifications. We can make plaques that are engraved (V-carved or flat bottom) , 2.5-D (flat relief or outline), or 3-D (sculptured bas-relief). We have a large library of existing 3-D and 2.5-D computer geometric models that we use to carve these plaques, which greatly reduces graphic artist labor costs. Visit the Plaque Styles section to view more detailed descriptions and many examples of painted HDU, metal-plated, and wood plaques. All our plaques are manufactured in the USA by American craftsmen. We can also combine materials on a plaque. We often use Mahogany plaque boards and carve 3-D HDU appliques which are either multi-color painted or metal-plated, to mount on the Mahogany. We often gild V-carved text of Mahogany plaques with 24K gold or silver leaf. We can also gild areas of painted HDU plaques, usually raised text and art. We can provide a 3-D bas-relief cast bronze and aluminum memorial or living person plaque featuring the face or figure of a loved one, etc. if we are provided a good photograph. We can also put digitally printed long-lasting full color vinyl (photos of family members or deceased, or very elaborate painted or digital art) as an applique on any HDU or wood plaque. Our plaques have wide variations in prices, depending on size and style. These can be made of different materials, cast bronze and aluminum, and bronze, brass, and silver-nickel (German silver) plated High-Density-Urethane (HDU) , and artist-painted wood and HDU. We can mount giclee printed digital color or gray scale photos on these plaques. Our STYLE page describes these different design options in detail. All 2000 photos of plaques on this website have a Style Category and a Price Code listed in the second or third paragraph in the text description under the photo (click on the photo or title to expand the photo and read the text to get the price code of that plaque, then look up the price for different size plaques with that style on the Price List at the bottom of the PRICE page). Our lowest price economy 2-D plaques feature digitally-printed full-color giclee vinyl appliques mounted on a round or rectangular a solid wood or acrylic base. The retail prices for this type of two-dimensional (2-D) flat custom plaque are as low as $85 (acrylic base) to $125 (Mahogany solid wood base) for 10 inch diameter plaques. The same style plaques in a 18 diameter size have prices of $120 (acrylic) and $220 (Mahogany). These low prices assume we have made a previous plaque of the same artwork design (featured in one of our Galleries of over 2000 photos, including photos of 3-D plaques such as shown below), or for new artwork, that we are provided a print-ready JPEG digital photo or colored drawing of the artwork for the plaque (this can be a good high-resolution photo of an existing seal). These are styles 1.4.1 (Price Code EA, wood base) and 1.4.3 (Price Code EB, acrylic base) on our PRICE page, with examples shown on our 2-D Giclee Plaque web page. Our carved 2.5-D multi-level or engraved hand-crafted and artist-painted plaques have prices about twice that of the 2-D flat plaques with giclee printed art. These prices depend on the size, material, carving complexity, and number of colors. Prices for custom carved 18 inch diameter 2.5-D artist-painted HDU or stained wood custom plaques vary from $240 to $370. Prices increase with size. The PRICE page gives prices for carved 2.5-D plaques of various sizes, materials, styles, and number of colors. About 90% of our home and family plaques are carved in 2.5-D multi-level flat or engraved relief, using High-Density-Urethane (HDU) or wood as the substrate. These are very popular and look great. These are located in kitchens, family rooms, children's bedrooms, dens, home bars and wine cellars, and man caves. Many times the artwork provided to us for custom seals does not benefit from 3-D rendering, and we recommend a 2.5-D or engraved relief carving which looks nearly as good and is about 2/3 the price. Our 2.5-D and engraved relief plaques carve faster and are much faster to paint than 3-D bas-relief plaques, so they have lower prices. Most of our military and many of our government and corporate plaques are also carved in 2.5-D relief. Our premium plaques are carved in 3-D bas-relief, using wood (usually Mahogany, Cedar, or Redwood), or High-Density-Urethane (HDU) as the substrate. These are higher- priced carved 3-D bas-relief artist-painted plaques, and have fabrication prices 3 times that of the 2-D plaques. Solid cast bronze or aluminum 3-D plaques may cost more than 10 times that of 2-D plaques. These are very high quality plaques, which usually feature complex artwork and are often displayed on the outside entrance to a home, in an entrance way, in a living or family room Fabrication prices for 18 inch diameter 3-D artist-painted or bronze, brass or silver-plated HDU or stained wood custom plaques vary from $380 to $560. Prices increase with plaque size and intricacy of carving, painting, and the amount of gold and silver leaf gilding, if any. In addition, for unique new designs that we have never made before, there may be a one-time 3-D geometric modeling fee of $300 to $600. The PRICE list gives prices for carved 3-D plaques of various sizes, materials, styles, and number of colors. These high-quality 3-D plaques may require from 5 to 10 hours of 3-D design labor by a graphic artist, 8 to 24 hours of machine carving time, and then 6 to 8 hours of artisan work to hand-sand and artist-brush paint or metal polish them. They are unique works-of-art for our most discriminating customers.